This article is by Mark Leslie, longtime Chairman and CEO of VERITAS Software, advisor and investor (and author of the foundational article on the startup Sales Learning Curve). For decades it was inconceivable that anyone could compete against IBM’s absolute dominance of the computing industry. It owned 65% of the market, with the rest divvied up between what were then known as the “BUNCH” companies — Burroughs, Univac, NCR, Control Data and Honeywell. They each had their own proprietary hardware and software stacks and kept to themselves. Everyone was fat, dumb and happy. They were so happy in fact, that they didn’t even blink when, in 1959, Digital Equipment developed and delivered the PDP-1 — a new breed of mini-computer with standard memory of 4K, 18 bit words, and a 200K clock speed. At the time, this seemed trivial compared to an IBM mainframe. But 30 years later, Digital Equipment had annual revenue topping $14 billion and had given birth to a new industry, seeding companies like HP, Data General, Prime, Varian and a host of others. Coinciding with the shift in hardware, the UNIX operating system — developed by AT&T in the late 1960s and early 70s — entered the mix, eating away more of IBM’s domain and opening the door to microprocessor based systems hosting UNIX, such as those from Sun Microsystems, which became the primary computing platform of the 90’s. By the end of the decade these companies had vanquished king IBM, relegating it to its shrinking yet still profitable mainframe business. For the last half of the 20th century, it was almost impossible to find any business or industry article on the IT industry that didn’t mention IBM. Now you’d be hard pressed to find any article mentioning them at all — except to describe their descent. Leslie’s Law is about this cycle in technology: small, simple and cheap supplanting large, complex and expensive solutions. 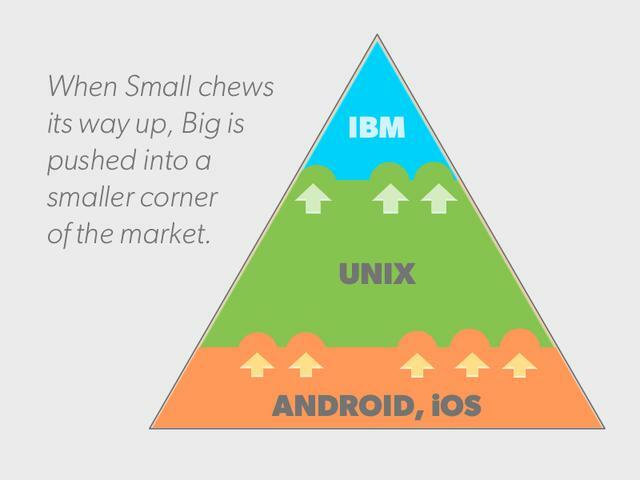 Eventually, and inevitably, these “small” entrants eat their way up the food chain into the market, capturing a larger and larger share, until the behemoths of the sector are forced to retreat back into a narrowing market niche. From 1990 to 2000, I was CEO of Veritas Software, with a front row seat for IBM’s demise and many other dramatic changes in the tech space. Time and again, I saw how smaller companies, ideas, and technologies, chewed into the larger, complacent players above them that seemed too big to fail. This article looks at what this means for startup teams today, and how they should take advantage of their size, speed and simplicity to win in the long haul. When you start looking at the world through this lens — that when small meets large, small almost always wins — you see it everywhere, across all tech sectors. It's so prevalent, in fact, that I consider it an industry law, in this case, Leslie’s Law. More examples, to follow, but first, let’s take a closer look at how this plays out. When a sleek, small player enters the market, it does so by creating a low-friction, high-fit and finish product that is sold at a low price to a large market. These new products are sold to a portion of the market that cannot access the larger products due to the cost of entry (in dollars and complexity) and the cost of ownership. The larger company may not even notice that they have entered the market since there are no mano-A-mano customer confrontations. This leaves the smaller company free to expand upward into the market. Their leading edge customers whose needs are expanding, and their own interest in expanding their market upward spurs them on to increase the features and functionality of their products. From the perspective of the large incumbent companies this upward migration is imperceptible. They aren't worried so they don't pay attention to it. But it’s happening. The typical reaction of the incumbent 'large' company in the market is a mix of denial, innovator’s dilemma and dismissive arrogance. Inevitably, by the time the threat becomes compelling, it’s too late. The small company has taken root, developing the advantages of a lower-cost structure with a simpler, lower-friction product. A new ecosystem has already sprung up around its core offerings. It’s here to stay and its inroads into the incumbent’s territory can’t be stopped. This process is especially relevant today as we enter an age of unbundling. What is just one segment of a major company’s offering is now done more efficiently and better by a standalone startup. Look at consumer packaged goods, where P&G reigns supreme. Harry’s is winning by focusing only on cost-effective razors, and Walker & Company by focusing on mission-driven cosmetics. Nest, Dropcam, Ring, Quirky and more are tearing into the smart home market once cornered by Honeywell. All while Shyp, Flexport, Uber and Postmates turn FedEx’s universe upside down. Right now, we’re seeing the proliferation of small, lean and mean players poised to attack the big to mid-size players above them. Applying Leslie’s Law, the landscape of companies serving most of our basic needs will look very different in just a few short years. For over a decade, it seemed unlikely that the sun would ever set on the age of UNIX-based systems from SUN and HP — or the empire of desktop computers that has come after it. But as the incredible trend toward mobile phones as the “first screen” in people’s lives continues, smartphones will win the day in short order, at least until something else comes along. Hardware is an easy example to visualize, but the same trends have swept through software again and again. The database industry transformed over multiple generations — mostly under the watchful eye of Oracle — but now smaller technologies are challenging its relative hegemony. One sterling example is in the CRM space. For as long as anyone could remember, the market was owned by Siebel. It was big, offering an incredibly complex solution that had to be installed for customers on their servers, licensed in bulk, with tons of training and customer service attached. Sounds unwieldy, but it was the norm, and everyone needed it. Then along came a company called Salesforce.com, offering just one capability of the many Siebel already provided. Only they offered it differently — instead of having to buy hundreds of licenses, customer companies could pay per employee using Salesforce.com, and use it in their web browsers hassle free. They became the automatic choice for the many young companies that couldn’t afford to do anything but start small with SaaS. Even so, the larger incumbents like Siebel, comforted themselves that enterprise customers would never entrust their precious data and prospect lists to an offsite cloud-based system. Today, Salesforce.com completely dominates the CRM market and has an enormous ecosystem around it. Siebel, having had their lunch eaten right in front of them, became acquisition bait for Oracle. Salesforce.com’s ascent highlights the momentum of all cloud solutions, led by small, specialized companies purveying simple, easy to understand benefits for consumers and enterprises alike. Think Dropbox and Box, respectively. They are now what people think of when they hear the term ‘cloud,’ not the large, vertically integrated storage solutions of yesteryear. Another example is ZenPayroll, founded by one of my students from Stanford's Graduate School of Business. It focuses on doing one simple thing — payroll — and executing it as easily and simply as possible. People actually like to use this payroll system. By taking the pain out of this one task for customers, they're providing a solution that's more elegant and emotionally engaging than any that has come before it. Already, they're creeping into territory occupied by Intuit. 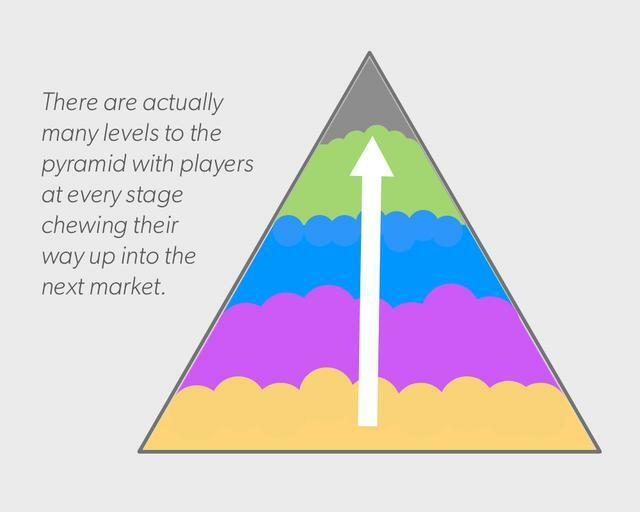 To adapt, that company will have to also expand upward, pressing on the players above them like Paychex, forcing them into the pinnacle of the pyramid, that much narrower position that precedes becoming obsolete. If you asked the folks at Paychex what they think of ZenPayroll, they’d probably consider them a little mom and pop operation, or maybe say they never even heard of them. That’s what makes the startup so disarming. They themselves are small, making them the perfect option for small customers — family businesses with 10 employees, bakeries, book stores — of which there are many more. 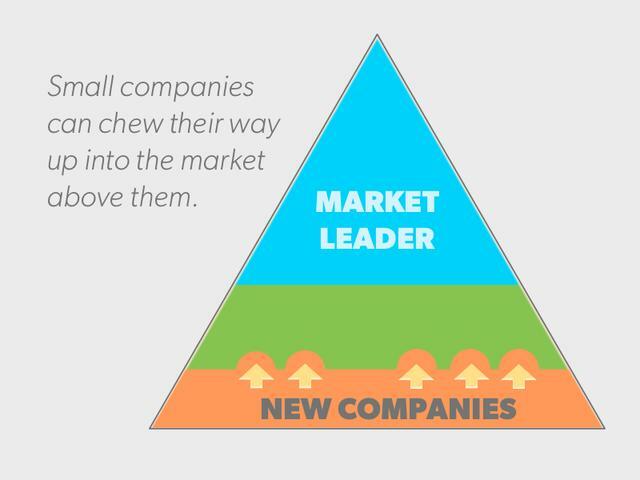 Earning their loyalty will give them the firm foothold they need to capture more and more market share. One might argue that Leslie’s Law doesn’t always apply — that there are some things you simply can’t build small. To counter, there’s the example of Rocket Lab, a New Zealand-based maker of small rockets powered by small, fast and agile motors that can deliver small satellites at unprecedented low prices and with unprecedented frequency and reliablity. In this case, Rocket Lab is only able to deliver payloads of 100 kg., a small fraction of the capacity of a SpaceX rocket. But instead of spacing launches months apart, they think they can do it as often as once a week for just a million dollars a pop. That opens up a whole new field of possibilities for Rocket Lab that will give them the boost they need to start chewing their way into other markets. So what does this mean for startups? What’s the lesson here? The practical takeaway that startups can internalize and act on? There's always the temptation to over-feature your product, to build in bells and whistles because server space is cheap and you have the funding and talent to do it. Resisting this urge is your real competitive advantage. Your rallying objective should be to build something truly great for the low end of the marketplace, solving an important problem with a simple, low-friction product in a segment of the market that's underserved by the incumbents. Once you've achieved excellent market traction in this arena, you can nibble your way upward until you're competitive with the heavyweights of your industry. That said, you should always keep one eye looking behind you so you can see the next young company that wants to eat up your market share someday. As a side note, I recently wrote a paper called the Arc of Life that speaks prescriptively to the larger, more established companies, giving them advice on how they can continually transform to avoid losing ground and going extinct. It's never too early to start thinking about what you'll do next to survive. Mark Leslie is a Lecturer at the Stanford Graduate School of Business where he teaches courses in Entrepreneurship, Ethics and Sales Organization. He is also the managing director of Leslie Ventures, a private investment company, and serves on the boards of two public companies, six private companies, and three nonprofit organizations. Prior, Leslie was the founding Chairman and CEO of Veritas Software. He tweets at @mleslie45.